One of the easiest lesson plans for Patricia Polacco books, Thank You, Mr. Falker is great for teaching about author’s purpose. Discuss with your students how an author has a purpose for writing a book. This purpose is usually either to entertain, to persuade, or to inform. After reading Thank You, Mr. Falker to your students, ask them why they think Patricia Polacco wrote this book. Since this is a fiction book, the most common answer is “to entertain.” However, she is also informing readers about dyslexia and about her difficulties reading as a child. It is most likely that Patricia Polacco hopes children will read her book and know that even if they struggle with their schoolwork, they can still be successful in life. You can also discuss with students that Patricia Polacco wrote this book to inform people about her special teacher and to thank him for making a difference in her life. These are not the usual reasons why authors write a book, which is why this is a great book to use to talk about author’s purpose. Another one of the easy lesson plans for Thank You, Mr. Falker is discussing the characters’ feelings. Before you discuss the characters’ emotions in this book, talk with students about different types of emotions besides happy, sad, and mad. Make a list of emotions that people can feel. In Thank You, Mr. Falker, Trisha doesn’t always feel the same way. How is she feeling when she knows she will be going to school and learning to read? (Hopeful, excited) How does she feel when the words are jumbled, and it’s not easy for her to read? (Frustrated, embarrassed) How does she feel when Mr. Falker works with her and helps her understand reading? (Relieved, excited, happy). After you have discussed different events in the book and the way characters feel (such as the examples above), then ask students to pick one of the emotions and write about a time when they felt the same way as Trisha. Younger students can write a few sentences and draw a picture to help tell their stories. Older students can write a personal narrative. 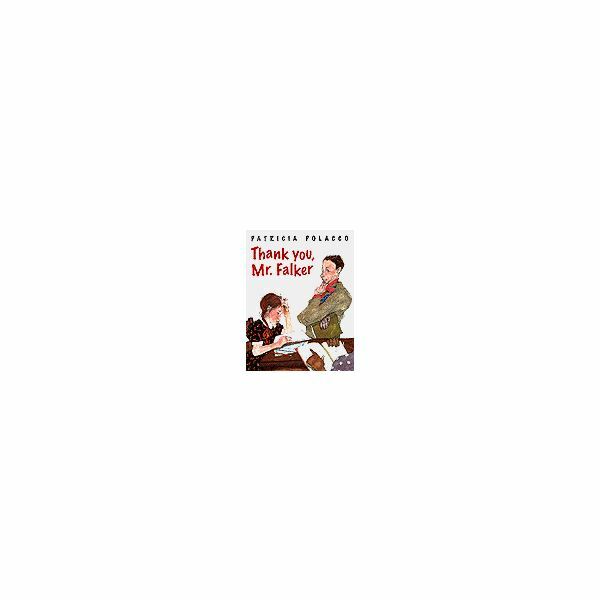 One of the great things about Patricia Polacco books like Thank You, Mr. Falker is that the author often writes about events that actually happened in her life. Students can easily make personal connections with the characters in the story because they are real people. For example, many of your students may have difficulty reading or learning their multiplication tables. Maybe they’ve had a special person help them the way that Mr. Falker helped Patricia Polacco. You can ask students to share their experiences through writing in their journals. Students might want to make this special person or teacher a thank you card. It doesn’t necessarily have to be someone who helped them with an academic subject. It could be an adult or older student who helped them learn a sport or a craft, too.